To request any of the Institute's reports in an accessible format please email us. Controlling the behaviour of people experiencing mental health crises by strapping them into beds or chairs or overmedicating them may seem like something that would happen elsewhere, or in the past. Yet it sometimes happens here in Australia, in 2018 and may even be permitted under mental health laws. While most Australians who experience mental health conditions can seek help on a voluntary basis, legislation exists to allow for people with severe mental health conditions to be compulsorily detained and treated, regardless of their wishes. A Melbourne Social Equity Institute research team is examining ways of avoiding coercive practices to ensure people experiencing mental health crises are treated with dignity and respect. Most recently, the team undertook a systematic review of global practices that aim to reduce, prevent and end coercive practices in mental health settings. The review was commissioned by the United Nations Office at Geneva. It will inform a report of the United Nations Special Rapporteur on the Rights of Persons with Disabilities, whose role is to promote the human rights of persons with disabilities worldwide. 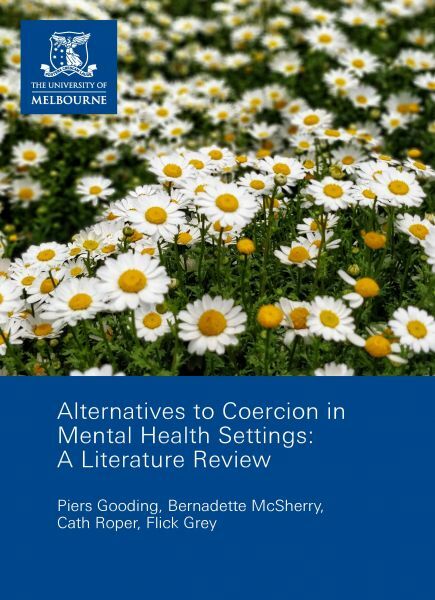 There are several motivations for finding alternatives to coercive practices in mental health settings. Most notably, persons with mental health conditions or psychosocial disabilities themselves have consistently pointed out the human rights implications of involuntary detention and treatment and have advocated for alternatives. International human rights law, and particularly the Convention on the Rights of Persons with Disabilities, has also challenged governments to improve access to voluntary mental health support and to reduce, prevent and end coercive interventions. The review was prepared by the Melbourne Social Equity Institute's Professor Bernadette McSherry (Foundation Director) and Dr Piers Gooding (Research Fellow), together with Ms Flick Grey and Ms Cath Roper. The review seeks to elevate the perspectives of persons with lived experience of the mental health system and to emphasise materials generated by persons with disabilities themselves. Ms Grey is a survivor of childhood trauma and has an academic background in sociology, linguistics and mad studies. Ms Roper’s thinking and positioning is influenced by multiple experiences of being subject to mental health legislation involving compulsory treatment, detention and restrictive practices. The list of practices compiled by Ms Grey and Ms Roper – and supplemented by the literature review – are included in Appendix Three.